Because humans are complicated beings, we respond to a number of different stimuli. Some are at very basic reflex and chemistry levels, such as "fight or flight". At the other end of the spectrum, we can intelligently consider various pieces of information and arrive at reasonable conclusions. Somewhere in the middle is the complication of emotions. Although they can respond to logic when recognized and a decision is made to bring them under control, they often arise unbidden. People have been "thinking" through their emotions for a very long time; I believe it is worse now than it used to be. There are people who want to manipulate others through emotions (whether deliberately or intentionally), and we need to be on guard against such tactics. That is one reason I wrote a series about common logical fallacies. By recognizing fallacies and the way so many are based on appeals to emotions, we are less likely to fall for tricks, and can improve our own thinking processes. But we are people, after all, and emotions are a part of what makes us human. Keep in mind that there is a fine line between influencing and manipulating. Manipulation tries to remove someone's choice and bypass their reasoning abilities. Influencing can have an emotional appeal, but respects people enough to let them make their decisions without trickery. One of the simplest appeals to emotion for the purpose of manipulation is labeling or name-calling. Many words have connotations (secondary meanings in addition to the actual meaning), and many of those are emotionally-laden. Labels can be useful as reference points in dealing with people, especially for those who label themselves. Definitions are often vitally important, and people may need to clarify what they mean with labels. I am a Christian and a biblical creationist. How you understand those words and relate to me may be different from my understanding of them. Labels are often assigned to people as ad hominem attacks, and are also used to poison the well. Misotheists and anti-creationists often want to silence the opposition, and a way to do that is to use negative labels in an effort to negate what the other person has to say. One of those is "homophobe", which is actually an overused nonsensical word. According to some people, those of us who believe what the Bible says about homosexuality being a sin, we get labeled with the nonsense word "homophobes". Although I do not phobe any homos, the word "homophobe" has the baggage of someone who hates homosexuals and advocates violence against them. "He's just one of them homophobes. Gonna stone a gay to death today? Hahahaha!" Emotionally-loaded terminology plus ridicule in a personal attack, and the well may be poisoned. Others on the same low intellectual level are manipulated in joining the hate from the label-er against the label-ee. There is not much actual thought here, just emotional reactions and manipulation. Another of those words is "fundie". "I went to a fundy site and trolled them because I'm so much smarter than they are, and I prove it by acting like a child! Hahahaha!" Just a minute there, Poindexter. Do you know what a "fundy" really is? It has nothing to do with the Bay of Fundy in Maine. If you're going to insult someone, at least spell it properly. Let me ask again: Do you know what a fundie really is? 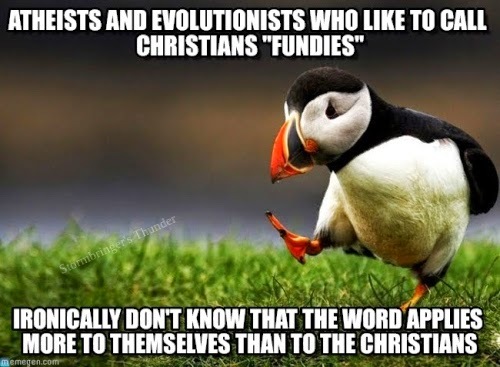 Some do know that "fundie" is short for "Fundamentalist". Here again, definitions are important. I did an article on that some time ago here, so I will not reiterate much of that content. Suffice to say that it has become a rather imprecise word that means someone who believes in the fundamentals of his or her faith. The connotation is very negative, and some see a Fundamentalist as a rigid, anti-intellectual, dour, humorless Christian. For a while, Mohammedan terrorists were referred to as "fundamentalists", but now they are called "radicals". (Perhaps people wanted to switch the emotional baggage of "fundamentalist" or "fundie" to Christians. I'm speculating on that, though.) However, that knife cuts both ways. Atheists and evolutionists have their own fundies. The religion of atheism and religious cult of evolution have their share of fundamentalists in the most negative sense of the word. They attack and malign Christians and creationists, resorting to the previously mentioned emotional manipulation, trolling, litigation, protests, as well as numerous logical fallacies, plagiarism, selective citing, slander, libel and so much more. Then they wonder why people don't like them! It seems to me that if someone was convinced that his worldview was correct, he would smile to himself and go on about his business instead of spending time and money trying to destroy something that he does not believe exists in the first place. Does that strike you as rational behavior? On a side note, if evolution were true, we would simply be bundles of chemicals doing what they tell us to do. We cannot even account for the reality of our thoughts or memories, because they may not really exist, we just think that we think. Someone would therefore have no legitimate right to complain that I am a heterosexual married man that believes in God, affirms that homosexuality is a sin, refutes atheism, teaches the truth of creation science and so on — I was born that way. Deal with it. There would be no ultimate moral standard, no "right and wrong", and "justice" would be ridiculous. But God does exist, and there is an ultimate standard of morality. Using words with connotations are also used to have a positive influence. Atheists have many of these, using terms like "rational", "freethinker", "brights", "skeptic", "reason" and so on to appear that they are more intelligent than others. Watch for terms like, "Rationalists believe in science" (which is automatically self-refuting) and, "Fundamentalist ideologues..." (that last bit has two loaded words in a row, you may have noticed). "Theistic evolutionists are more moderate Christians than creationist fundies". They build themselves up and put others down through loaded terminology and pejoratives, and do not use reason to refute positions they disagree with. I expect that thinking people who encounter terms like, "Creationists use disgusting lies in a desperate attempt..." will move along and find something better to do. Who ya callin' a fundie, fundie? Definitions are important. When someone uses a word with emotional "punch", it becomes more important to understand what is meant by the word. Also, if someone is using several of these emotive words at a time, that should set off your inner alarm bells so you can consider if that person is really saying anything at all, or just provoking a reaction. It may just be an atheist or evolutionist fundie with nothing to say.